The modest gain in yesterday’s S&P 500 Index was notable. The index closed above the weekly and daily resistance area on our chart at 2832.94, for the first time since October 2018. RightView Trading’s take on the broader market was featured on the February 5th “Off the Charts” segment of Mad Money. At that time we expected the S&P to rally 3.5% to retest the weekly resistance zone. It did that and now has closed above it. We further speculated that if the technical indicators remained positive the index could rise another 4%, to test its historic October 2018 highs. 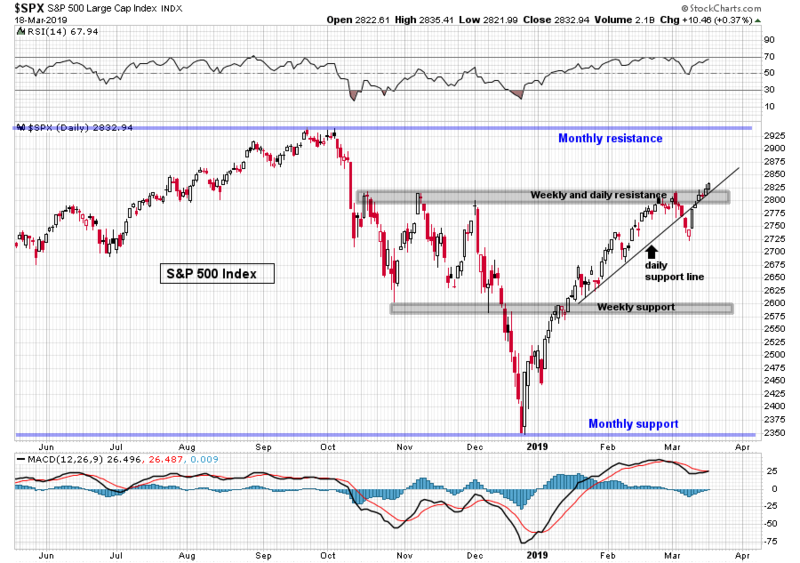 On the daily S&P chart, the relative strength index is still tracking higher and above its 21 period moving average, reflecting continued upside momentum. Chaikin money flow has come off since the “Off the Charts” segment but remains in positive territory. The Chaikin money flow oscillator, which we have been utilizing more often, is ascending and is back in its upper zone. There is, of course, the well-known attractive element of new highs – the magnetic affect they have on stock prices. It seems to pull them to new heights based on the shear willpower of trader sentiment. As stated back in February, our technical take is that the S&P 500 is headed back to its old highs. 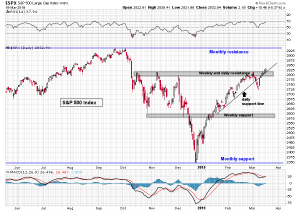 We think the market in general has positive momentum and is in good technical condition. But here’s the disclaimer; we live in interesting times and it is impossible to factor in the multitude of potential exogenous events on our plate. That is why it is crucial to be aware of support on multiple timeframes and have disciplined stop loss levels. Hopefully, we’ll update this post when the S&P 500 hits 2940.